Applications are open ! Visit OUR NEW APPLICATION PORTAL and fill your preliminary application to get a shot at the best global internships next year. Create account first -> confirm email ! Continue through the form ! If your Studiengang/Study Course is not in the list - NO PROBLEM. Choose the one you like best! NO MOTIVATION LETTER REQUIRED ! Mandatory internships are internships required by university. If you don't know, select NO! Application process always starts in October! Please follow our facebook page or regularly check this website for updates! We are happy that you decided to apply for an awesome IAESTE internship in 2019. Before you start your application, here are a couple of hints to fill out the online form for pre-application. Please fill in all the requested contact information. Please also give us your phone number as we might have to reach you quickly. This will only happen if you have chosen you favourite offers later on and we have questions regarding your internship. In addition we recommend you to use your university e-mail address. This will also be your username later on for your login to the application website. Rate your language knowledge. If you know more languages than the given ones, please list them under additional information at the end. Pick your desired specialisation, duration and time frame for the internship. Let us know if this internship is mandatory for your studys. Have you already made an IAESTE internship before? Accept the terms and conditions so we can use your contact details for all updates about the current application process. You have completed the Pre-Application for internships in 2019. Once we received the offer list, we will contact you via email and inform you about the next steps. At the end of january we will publish the list of all job offers available for sudents in Germany. You will be asked to pick your favourite offers for your personal wishlist. In February we will get back to you with denial, approval or a request for a motivational letter. If you get an approval by IAESTE Hamburg, you will have to prepare the application for the employer. If not, we will inform you about our late offer list. 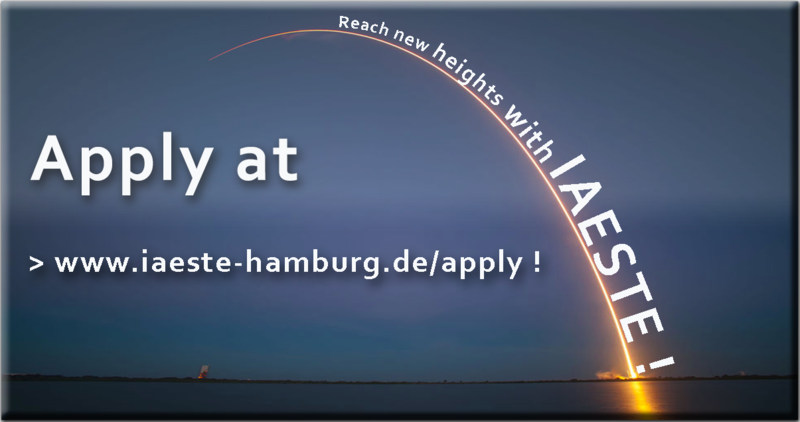 The IAESTE local committee Hamburg provides internships for students in Hamburg in all technical and scientific fields. There are internships offered both in the industry as well as in research institutes. Most of the IAESTE internships last about 2-3 months and usually take place during the summer months. All IAESTE internships are paid; the salary is based on the approximate costs of living in the receiving country. IAESTE takes care of all necessary formalities and usually provides accommodation for the trainees. This service is free for students enrolled in German universities due to the integration of the IAESTE programme into the German Academic Exchange Service (DAAD). In January, all member nations exchange the internship placements at a big international conference. We then announce which internship offers have been exchanged to IAESTE Germany. It is a list with around 700 jobs in over 80 nations worldwide. Each offer on the list contains information an time period and duration, required study level and major, language requirements and other required abilities. You are asked to choose up to 10 favourite placements. But please read the requested criteria carefully as most employers won't accept you if you don't fulfill all of them. Please be aware that it is possible we won't get one or all of them to Hamburg to distribute it to you. Please take a close look at the offers in less known countries, as they are generaly really interesting and chances are higher you get the offer. c) a denial because unfortunately we didn't get your offer. We will also send you a list with late offers via email. Students who have been approved (either direct or after sending their motivation letter and being accepted) will have to apply to their employer until March 30th. Over 80% of the employers accept students if they fulfill all the requested criteria (e.g. study major, study level, language level). Starting May students receive their acceptance letters by the employers. You can now start to apply for a Visa if required, book your flight, search for accomodation (if not provided by the IAESTE committee in the guest country) and apply for the traveling allowance at the DAAD ("Fahrtkostenzuschuss") and enjoy your IAESTE experience.